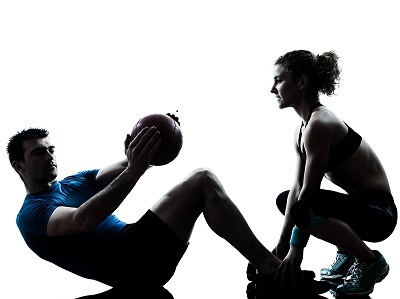 Swiss balls are in common use for many core strength exercises in conditioning gyms nowadays. The use of Swiss balls should be seen as just another way of exercising your trunk muscles. The apparatus adds variety to training. Doing the same exercise slightly differently can help to push the body to further adapt and change for the better. Positive adaptation to exercise normally comes through planned rest and recovery in your training program, but, sometimes “a change is as good as a rest”. It also goes without saying that you will get less use out of a poor quality ball because of the thinness of the material than one of higher specification. Although this exercise trains and strengthens the shoulder girdle, it does strengthen the trunk in a lengthened position which stabilizes the central axis. For this reason the Over The Top is a good trunk exercise for many sports. Kneel behind the ball with your hand placed on it. Move forward rolling over the ball stomach first, walking forwards with your hands until only your thigh is resting on the ball. Get into a nice elongated position where your spine is neutral. Your head should be level with your spine as you look straight down at the floor and your body should be perfectly straight and parallel with the ground. Now, push away with your hands keeping your back straight. Then, pull your body forward up over your hand, again keeping a straight body line. You should push backward and as you pull yourself forwards, draw your stomach into your spine and flex your hip and knee to bring them under your body. To return to the starting position, extend your legs away by pushing then back. As you can see the over the top exercise can be adapted to link the trunk with the shoulders or the trunk with the hips. Either way you have to admit that they are both very good core strength exercises. From "Core Strength Exercises" To "Faster, Stronger, Better – Your Shortcut To Improved Athletic Performance"